FINALLY! The perfect accessory for your smart phone or tablet! Introducing the MendiMos Lazy Neck Phone Holder. If you’re looking for a holder that meets your demands, look no further. Our holder can provide what the competition absolutely does not! The utmost comfort when you wear our holders on your neck. Watch or scroll on your phone or tablets with no worries. MAKE LIFE LESS STRESSFUL AND SET COMFORT AS YOUR #1 PRIORITY. CLICK “ADD TO CART” AND SET YOURSELF APART FROM THE CROWD! ✔️ SUPERIOR COMFORT - Our #1 priority is to satisfy you, the customer. We understand how uncomfortable most neck holders can be, our holders include a memory foam support to provide optimal comfort. ✔️ WIDE COMPATIBILITY - Compatible with all size smart phones and tablets that range from 4.7" to 7.5" wide including: Iphone X, 8 & 8 Plus and older models, Samsung Galaxy S9, S9+, and older models, LG, Google, Nokia, Motorola, iPad Air, iPad Mini, Amazon Fire, etc. ✔️ UNRESTRICTED FLEXIBILITY - From taking hikes, to waiting at the airport, you can adjust our holder to fit any of your needs. Because of the our highly durable aerospace grade aluminum, our holder is less susceptible to wear when shaping it to fit your lifestyle. ✔️ ENDLESS NUMBER OF USES - Our neck holder can be used for just about anything you put your mind to whether it be sitting down in the park to watch a movie, using your phone to read a book, vlogging, or even video chatting! ✔️ MONEY BACK GUARANTEE - We wouldn't be selling this product if we didn't believe in it, so if you aren't satisfied, we will take it back and give you a 100% full refund NO QUESTIONS ASKED! 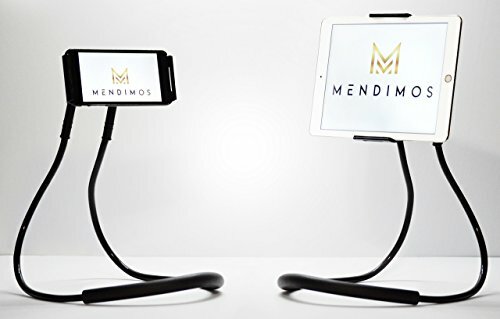 We are confident you will enjoy all the benefits that a MendiMos neck holder can provide! If you have any questions about this product by MendiMos, contact us by completing and submitting the form below. If you are looking for a specif part number, please include it with your message. Bike PHONE MOUNT [ Size L ] Made of Durable Non-Slip Silicone. Mobile Cellphone Holder /Universal Cradle for All Bicycle Handlebars and 99% of Smartphones: iPhone X, 8, 7, 6, 5, Samsung etc.